The USS SHREVEPORT (LPD-12), an Austin class amphibious transport dock, was commissioned on 12 DEC 1970. USS SHREVEPORT was built at Lockheed Shipbuilding at Seattle, Washington and after fit out and shake down steamed for her new homeport of Norfolk, VA, arriving in February 1971. After REFTRA in Guantanamo Bay, Cuba, SHREVEPORT her first of many Atlantic crossings in June 1971. Over the next twenty six years SHREVEPORT deployed as any Atlantic "Gator Freighter" would; GITMO for REFTRA after overhauls and the cycle of maintenance availability, amphibious ready training in preparation for the "Med", the North Atlantic, the "IO". USS SHREVEPORT served her country for 36 years, 9 months and 14 days, until decommissioned on 26 SEP 2007. SHREVEPORT is laid up at Naval Inactive Ship Maintenance Facility in Phila., PA.
Shreveport (LPD-12) was laid down on 27 December 1965 by the Lockheed Shipbuilding and Construction Co. Seattle Wash.; launched on 22 October 1966 sponsored by Mrs. Andrew McBurney Jackson Jr. and commissioned on 12 December 1970 Capt. Peter H. Pehrsson in command. On 22 January 1971 Shreveport departed Puget Sound for her home port Little Creek Va. where she arrived on 21 February. Between 9 March and 9 April 1971 the amphibious transport dock underwent shakedown training at Guantanamo Bay Cuba and from 16 June to 4 August she carried 375 midshipmen from the United States Naval Academy on a training cruise to Northern Europe. After post shakedown repairs from 6 October to 24 November 1971 she sailed for the Caribbean where she participated in landing exercises during the first part of 1972. On the 12th of June the ship again sailed on a midshipman training cruise to Northern Europe visiting the Azores; Aalborg Denmark; Portsmouth England; and Le Havre France before returning to Norfolk on 3 August. During the rest of 1972 Shreveport conducted amphibious training exercises off the coasts of Virginia North Carolina and Florida. Shreveport with Amphibious Squadron 2 departed Norfolk on 4 January 1973 for her first tour of duty with the 6th Fleet in the Mediterranean. The squadron stopped at Morehead City N.C. and embarked elements of the 6th Marines (BLT 1/6) before it proceeded to Rota Spain where it was assigned to CTF 61. The task force departed Rota on the 16th called at Cannes France on the 18th and was underway for Monte Romano Italy on the 22d. During her six-month deployment Shreveport also visited ports in Italy Greece Crete and Turkey before returning to Morehead City on 2 July. The marines were offloaded and the ship continued to Norfolk that afternoon. Shreveport operated in the Norfolk area until February 1974 when she sailed with PhibRon 2 for operations in the Caribbean. She returned to her home port on 19 March. The ship made another trip south to the Canal Zone area that lasted from 18 April to 4 June. 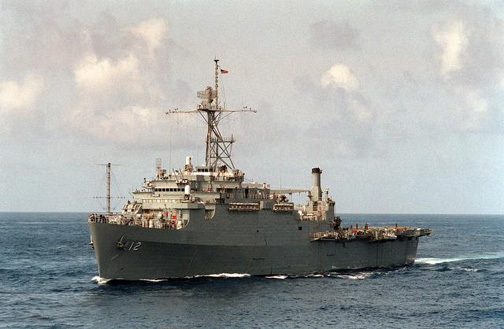 On 24 June Shreveport sailed for Rotterdam and another deployment with the 6th Fleet where she serves into July 1974.